Up until 2007, you could count on electricity usage going up. 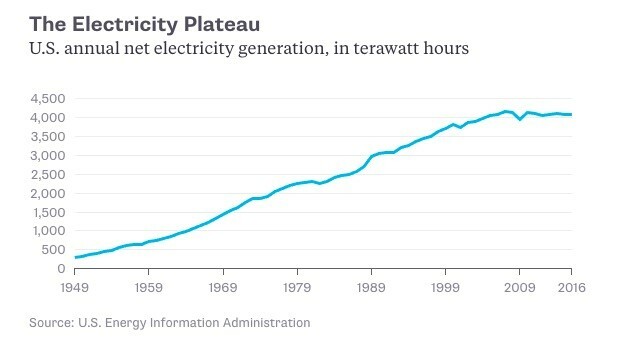 In fact, since the time that electricity was harnessed for technological use in the 1800s all the way up to the year 2007, we produced and consumed more energy pretty much every year. Then, in 2007, this 200-year-old trend went bust. We saw less electricity consumed in 2008, then again in 2009, and now we’re back to levels last seen in the 1990s, as is clear from the chart below. Better use of existing resources. Rooftop power from solar panels. An undefined structural shift in our economy. I believe that all of these reasons play a role in electricity’s decline. But now something is about to happen that could change everything and make electricity a hot commodity once more … one that I believe will cause the market to sit up and take notice and the stock prices of some electricity companies to skyrocket. And that big event revolves around electric cars — specifically, the launch of Tesla’s Model 3, a self-driving car that’s going to be affordable, practical and constantly connected to the Internet. As I’ve been telling you in my Winning Investor Daily articles, the Model 3 is set to upend the entire car industry. And I believe that once people see the massive success that the Model 3 is going to be, all hell is going to break loose in the car market. Equally, electricity companies are going to see that the 10-year decline in demand is about to end, meaning we could see a period where electricity prices soar higher … making the stocks of companies that have extra capacity skyrocket. If you want to know why that’s going to happen, be sure to read my Winning Investor Daily article this Thursday, where I’ll explain it all in detail. « Previous The Detroit of Tomorrow?